Combat the Winter Blues with Vitamin D-Rich Foods! Does the lack of sunshine during the winter have you dragging your feet and not feeling your best? If so, you may have a Vitamin D deficiency. Not only does the sun put a little spring in our step, but it also is converted naturally to Vitamin D in our bodies. 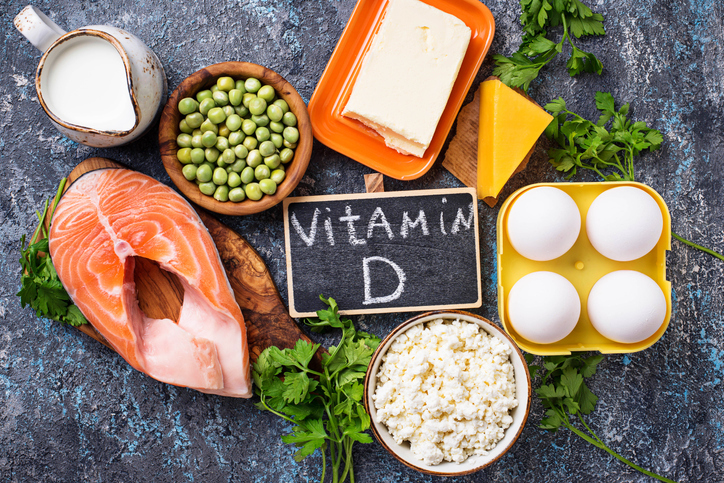 With the lack of sunshine in the northern part of the country, you will want to get these Vitamin D-rich foods into your diet. Not only will you feel better, but your mood will improve, too! Here is a healthy Grow Fit-approved recipe that uses salmon! Line a baking sheet with foil and spray with nonstick cooking oil. In a small bowl mix together the spices & brown sugar. Generously sprinkle the chili powder mix over the fillets evenly. Place the salmon on the baking sheet and broil for 6-9 minutes. Remove the salmon from the oven and brush with maple syrup. Return to oven and broil for an additional 1-2 minutes. The maple syrup will form a crust. Eggs – Don’t skip the yolks. This is where you will find the Vitamin D.
Mushrooms – Most sold in the stores have been treated with ultraviolet light and this is where the Vitamin D comes from. If you grow your own or buy directly from a farm, they will not be a good source. Fortified Milk – Vitamin D paired with calcium is great for your bones. Yogurt – Go Greek! Vitamin D is found naturally in Greek yogurt. If you buy other types of yogurt, you will need to see if it has been fortified. Fortified Cereal – Read the nutrition label to see if it is a good source! This institution is an equal opportunity provider. ©2019 Childtime Childcare, Inc.